Along with Brauqe, Picasso is considered the father of cubism and a deity among artists. Pablo Ruiz Picasso was born in Malaga, Spain in 1881. His father was a professor of drawing and the director of the Museo Municipal. His family moved to La Coruña and then Barcelona where young Pablo started his formal art training. It was here in Barcelona where he made contact with several modernist groups who influenced his ideas to break out of the academism he was being taught. In 1900, Pablo moves to Paris for a brief time and upon his return to Barcelona, starts working in a series of works with new styles. In the decade to follow he went through his blue and rose periods that later became legendary. After this he develops his characteristic cubist style which transcended all concepts in the world of art at the time. His art was often socially oriented as in the case of the Guernica. He also had torrid affairs with several women who fueled his subjects with romantic passion. 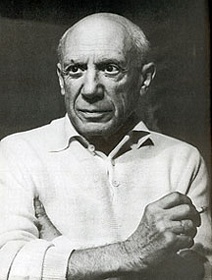 Pablo Picasso, an icon of modern art passed away in Mougins in 1973.